The picture below is a sample of the ratings index page. You will need to click the "back" button on you web browser to return to the real index page. Under the title "ISKA RATINGS" it describes the ratings table and the year. 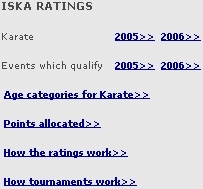 If you want to look at the Karate ratings table for 2006, click on "2006" next to the word "Karate". This will take you to the Karate index page for 2006. Next to each of the age groups is a link. Click on the link to show the top rated competitors for that age group. If you click on a name, you will be taken to a page which shows all the results for every competitor in that age group. In the first picture above, under the title "ISKA RATINGS" it also shows "Events which qualify". The "Events which qualify" are the events held at each tournament which qualify for ratings points. You can view the Club points at each tournament by clicking the word "Clubs" (see sample picture below). This concludes the section on "How these web pages work"